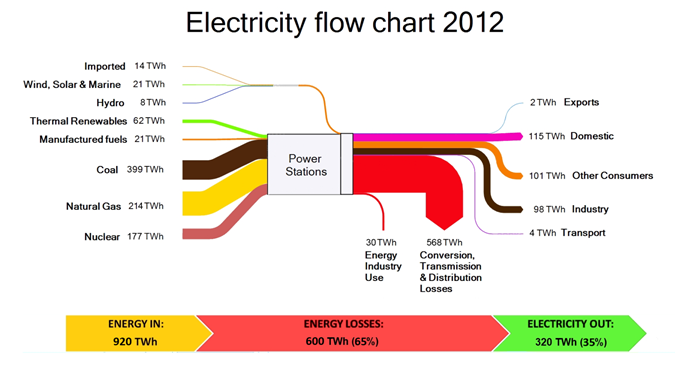 UK-based consulting firm Green Peninsula has the following Sankey diagram on their website showing electricity generation in the United Kingdom in 2012. Following up on my previous post on Iran’s Energy Balance, here is another Sankey diagram from p. 54 the latest edition of ‘Iran and World Energy Facts and Figures, 2012’ by the Ministry of Energy (MOE) of the Islamic Republic of Iran. Unfortunately the overall national energy balance of Iran is not depicted in the 2012 edition of the report any more. 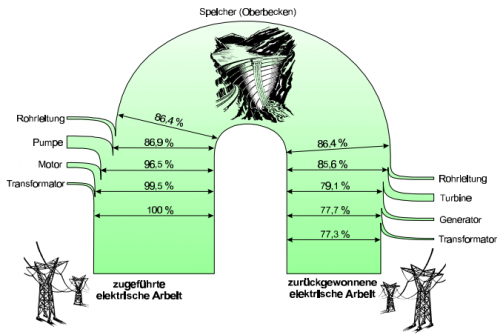 This Sankey diagram focuses on electric energy only. Flows are in GWh per year (in 2012). 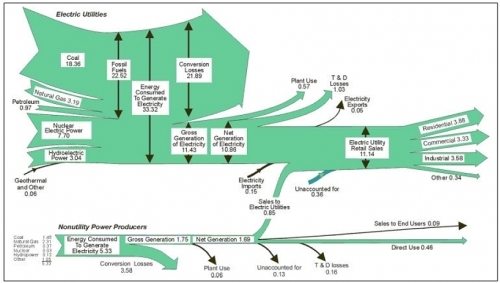 Fuel sources for electricity generation are broken down in thr first arrow. Losses branch out at the ‘pow plant’ node as a blue arrow. The generated electricity is further broken down in the vertical arrow into consuming sectors. The overall efficiency of the power plants is at approximately 34%. Note how the small arrow head peeking out to the left is not to scale, and understates the 63.6% transformation losses. 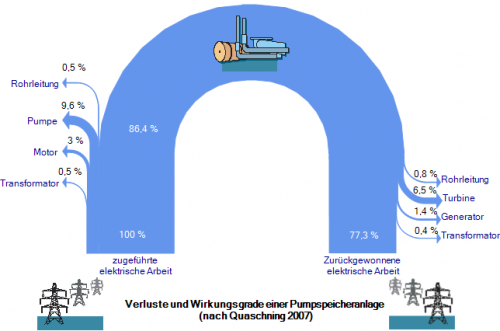 Nuclear energy is less than 1% of the overal electricity production. In 2011, the first year of production 327 GWh were produced from nuclear fuel, upping to 1847 GWh in 2012. See p. 50 of the report. 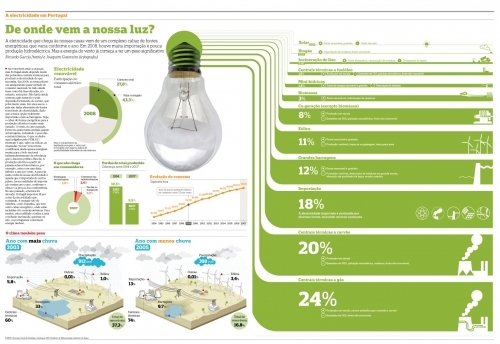 ‘De onde vem a nossa luz?’ Where does our electricity come from? The below infographic by Joaquim Guerreiro with text by Ricardo Gurreiro was published on April 22, 2009 in the Portuguese daily ‘Público’ (PDF). The composition of energy sources is shown with Sankey-like green bands instead of a pie chart. 24% of the energy is from natural gas, 20% from coal. 18% is imported energy and 12% from hydro power. The other elements of the infographic and the text describe how the production pattern changes from years rich in precipitation, when hydro can be up to 33%, compared to dry years where it accounts for less than 10% of the electricity production. Data is for 2008. The overall consumption of electric energy is kind of difficult to detect: 51.125 GWh in 2007. An online version of this infographic (without the Sankey diagram) is available at the Público website too. 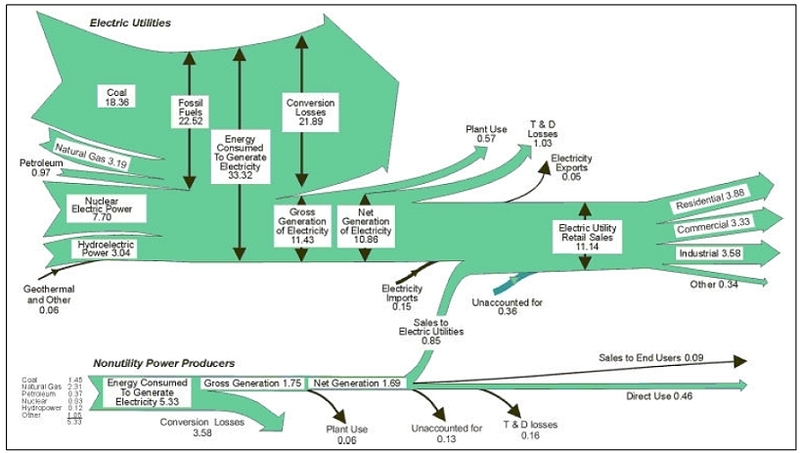 DOEs Energy Information Administration (EIA) produces a lot of energy statistics, and they often use Sankey diagrams to illustrate energy flows. One of their Sankey diagrams that dates back to 1999 has an interesting two-part structure. It actually is made up from two Sankey diagrams, which are connected by one flow. Values are in quadrillion BTUs. The top part of the diagram shows electricity produced from various sources, losses along the production line, and the consumption of the electricity in the “Residential”, “Commercial” and “Industrial” sectors. This is structured very similarly to other Sankey diagrams EIA publishes annually (example). 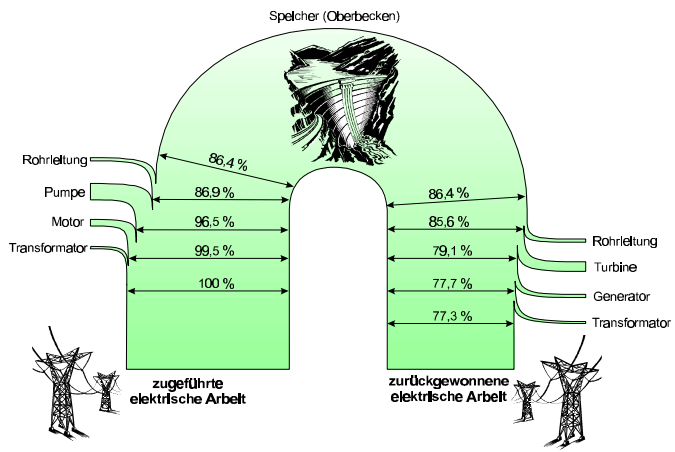 The bottom part shows another Sankey diagram for electricity produced by ‘Nonutility Power Producers’. So what exactly are these NPPs? Half of the electricity produced by Nonutility Power Producers in 1999 was fed into the grid, while the other half was consumed on-site. I imagine these are typically larger industrial facilities, that have their own power generation. The fact that nuclear energy appears in this section does irritates me a little bit, but as this page explains, the reason is probably a nuclear reactor in a national research laboratory, that is accounted for here.